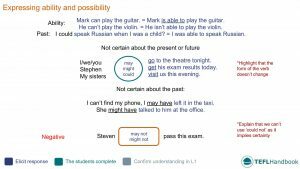 An ESL lesson plan for teaching English students about expressing ability and possibility in English. It includes a lead-in activity, several classroom activities and a game. And don't forget, if you use an iOS or Android device, you can get offline access to these materials through the TEFL Handbook app. 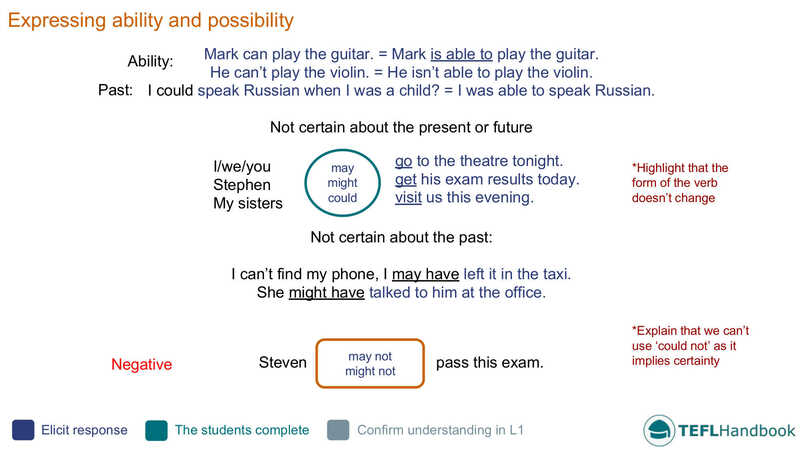 The board work below presents the modal verbs for expressing ability and possibility. Students at this level will be familiar with using 'can' to express ability, but probably not 'is able'. The colour-coded text should give you an idea of what information you can attempt to elicit as you step through each of the functional uses. When they have finished writing, divide them into pairs and have them interview each other about what they have written. Before they start, elicit possible question constructions and follow-up questions and add them to the board. 1. Somebody sees the Loch Ness monster. 2. A House is on fire while a guilty child looks on. 3. A child lost in the supermarket. 4. Somebody sees Bigfoot when they are camping in the forest. 5. Several people spotted a UFO over New York City. 6. It’s raining fish in the street. 7. You wake up one day, and there’s nobody in your town. Each group has to make a deductive sentence for each scenario that explains what could have/might have happened. When they have finished writing, discuss each scenario along with each group's explanations and try to decide on which one is the most likely. Encourage them to make their sentences as funny as possible. 1. Be good friends with somebody when they live in another country. 2. To juggle a busy work and social life. 3. Avoid responsibility for the rest of your life. 4. Become rich without going to University. 5. Avoid using the internet for the rest of your life. 6. Be good friends with your ex-girlfriend/boyfriend. 1. All groups work on the same statement for a few minutes before comparing and contrasting their results in a class discussion. 2. Each group works on a different scenario and present their opinions first, before opening the topic up to a class debate. Our suggestions for ESL games and activities require the minimum of resources (whiteboard and markers). At the moment, we have one game idea for expressing ability and possibility. 1. What would happen if we brought back dinosaurs? 2. Do you think people will live on Mars one day? 3. What would you do if you met your idol? 4. What would you do if an asteroid hit the planet earth? 5. What would you do if you could never use the internet again? 6. What do you think the world will be like in 100 years? 7. What would happen if we created AI? 8. What would you do if you become the next President/Prime Minister? 9. If you could choose to come back as any animal, what would it be? Our suggested next lesson is on using just, yet and already with the present perfect. If you've found these materials useful, be sure to check out our full list of intermediate ESL lesson plans. For other levels, have a look at our complete selection of EFL - ESL lesson plans. If you use an iOS or Android device, try out the TEFL Handbook app. An ESL lesson planner for English teachers. It has a lot more content and gives you faster access to our ESL resources, making it easier to use in class.